All set for the first half-term of 2018? 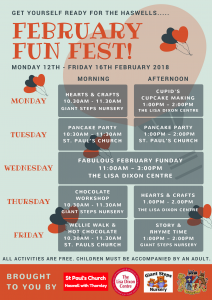 Well if not, don’t forget that The Haswells February Fun-Fest is on from Monday 12th – Friday 16th February for the kids! Brought to you by St Paul’s Church, The Lisa Dixon Centre, Giant Steps Nursery and Haswell Parish Council, all the events are free and children must be accompanied by an adult.